Making My 3rd Doctor Costume: Post Office Tower destroyed by aliens! Well, not actually destroyed as such, or even remotely damaged – but I just had to share these pictures with you. I was working in the West End today and was walking towards where the Post Office Tower (known these days as the BT Tower, but I prefer the original name) is. It was shrouded in mist and the upper half was totally obscured. I had to take a quick picture. 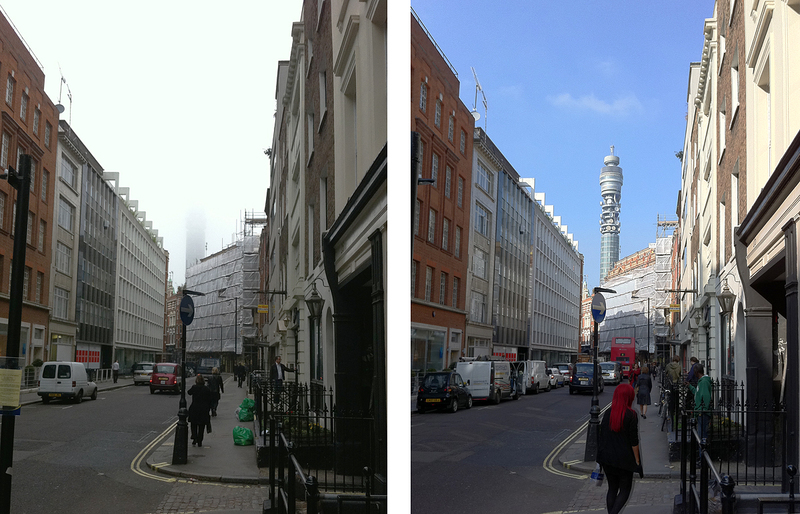 As it happened, at lunchtime I passed the exact same spot, and had to take another AFTER pic. Don’t know how I managed it, but there’s a taxi on the same spot in the road in both pics! the (at the time recently finished) Post Office Tower appeared in the 1966 William Hartnell story The War Machines.